Ben was delighted when I decided to change my electric piano for one of his acoustic pianos. I had the whole showroom to my self and played every piano whether upright or grand. Ben had a German Grotrian-Steinweg Concertino the second time I visited, which he thought would probably suit my type of playing. I played it the day Ben was moving showrooms and was left playing while all the pianos were being moved. Eventually it was taken away from me and as soon as it had arrived in the new showroom – which was within walking distance, I continued playing. This particular piano had already been accounted for so I had my name down on the next delivery! This was coming straight from the German factory to my house therefore a virgin piano. The tone was slightly different from the previous one which was more to my taste. 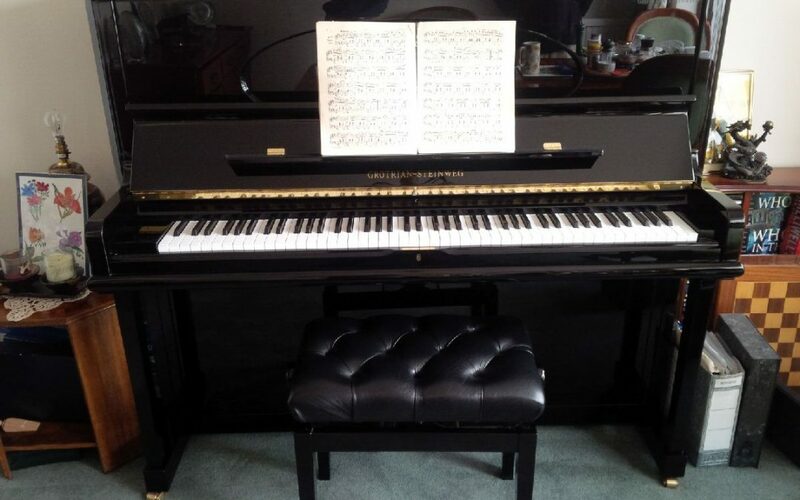 It is wonderful, as I had always wanted a German hand built piano and am thrilled to bits. The lid is never down and could very well sound like a grand piano! !